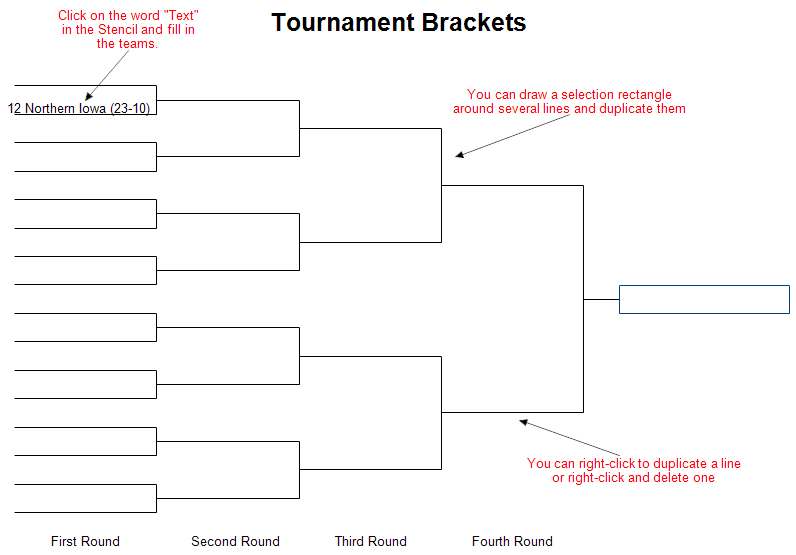 Description This bracket chart can be modified and used for your tournament. All you have to do is fill in the text and add or delete lines. Drawing Instructions If you haven't already done so, first download the free trial version of RFFlow. Once RFFlow is installed, you can open the above chart in RFFlow by clicking on tournament-brackets.flo. It is often easier to modify an existing chart than to draw it from scratch. The free trial is fully functional for 30 days. Click the word "Text" in the stencil and type in the name of a team. You may want to add the team's ranking and win-loss statistics, like (23-10). You can format the text just as you do in your word processor using bold, italic, colors, etc. Then drag the text over the line. If you need more lines, right-click on a line and choose Duplicate. To change the length of a line, left-click on the line and drag the handles. To delete a line or text, right-click on it and choose Delete. If you draw a selection rectangle around several objects, you can duplicate or delete them all at once. Drag objects to move them. If you want to draw your chart from scratch, you should add the Tournament Charts stencil. Click on the More Shapes button and scroll to Tournament Charts. The stencils are in alphabetical order. Then click the Add Stencil button. You can click on a shape and type in the name of the team. Then drag the shape to move it on your chart. After placing your shapes, you can click on a line in the stencil and draw lines between the shapes. If your chart becomes too large, you can size it to fit on one page by clicking on Tools, Size, Size Entire Chart, and the Fit Chart on Page button. To edit the text in a shape, double-click the shape. You can right-click a shape in a stencil and set the size in the Shape tab. Then every time you use that shape, it will be that fixed size.